The Serviceberry—also widely know as (among many other names) Juneberry, saskatoon, sarvisberry, mespilus, sarvis, shad-blossom, shadwood, shadblow, shadbush, sugarplum, wild-plum, and chuckley pear—has a good taste and is certainly hardy here. But, as with other fruit plants, while the plant may be hardy, it does not follow as the night the day that the fruit will survive freezes; we thus prefer types that flower later then the average. Fortunately, as serviceberries have become better known and more popular, named cultivars, and information about them, are now much more available than was the case only a few years ago. 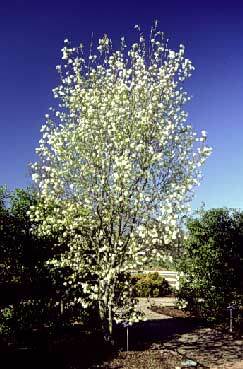 All of those names refer to related but slightly different plants: the genus is Amelanchier, but it comprises about 20 distinct species. But for berry-growing purposes, we can just lump the lot as serviceberries (or whatever other handle you choose to call them by). Though the plants are self-fertile, we’d put in one of each, just to cover all the bases. By the way: why the heck isn’t this guy even better known? Not only does he produce delicious edible fruit, he is hardy from Zones 3 to 9, he reportedly makes superb fall foliage (many people put them in just for their decorative value—see image at left), is very drought-tolerant, is compact (circa 10 to 15 feet high) but so sturdy that he makes, and is commonly used for, an excellent windbreak, and is even self-fertile! America, what are you missing here? (Canada knows and loves it.) One problem may be that people who know the plant from landscape use may not realize that not all cultivars taste the same, by any means: though all the berries are edible, only those from species reckoned as food types will have the superior taste associated with this fruit. Plan on putting your serviceberry seedling plants into the ground in late spring or early summer, say June. Set them in a full-sun location, keep them well watered, and consider some high-phosphate fertilizer. Have patience: serviceberries show very little visible growth in their first year. But they should begin to flower and bear fruit in 3 to 4 years. They should reach peak production in 8 to 10 years, after which they will probably outlive you. You will get zero fruit if you don’t protect well against birds, which adore serviceberries. Don’t just cast a net over the bush (or tree): make sure the net comes right down to the ground, and is secured there, else the little darlin’s will hop right under it. This is yet another of the highly useful fruits from the Rosaceae family, which supplies us with so much of our fruit and berries. The plant is native in both the Old and New Worlds; it was a valued foodstuff of the native inhabitants of North America, who used it to (among other things) flavor the staple food mix pemmican. The preferred name “serviceberry” derives from the similarity of the fruit of this bush to that of the related European “service tree” (Sorbus domestica), a name that came in turn from the French sorbier, which is from the Latin name for the tree, sorbus, a usage mentioned by Pliny the Elder. It was last modified on Tuesday, 12 February 2019, at 05:45 EST.